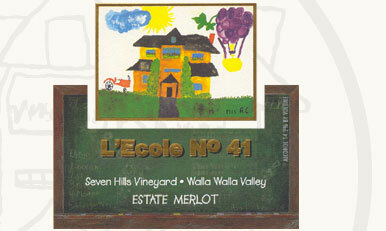 L'Ecole Nº 41 is a must stop in Walla Walla, WA. The wine is outstanding and the tasting room is nestled in an charming historic school house. Recess Red is a wonderful house wine and honestly they don't put out there anything that isn't truly wonderful but it is the dynamic duo of Apogee and Perigee that have captured my attention in the tasting room. I tend to think of this duo that Apogee is the confident, earthy man and Perigee is the elegant, refined woman. They are "it" couple of the wine world. have garnered a tremendous amount of accolades to the point that it is possibly their most sought-after red wine. Apogee is a blissful blend of Cabernet Sauvignon, Merlot and Cabernet Franc, this boldly aromatic wine has spicy aromas of nutmeg with a trace of cinnamon and cloves, earthy hints of sweet tobacco and slight suggestion of leather, with tastes of dark fruit flavors such as black cherry, anf dark plum. Simply stated, Perigee exemplifies elegance, the essence of the Estate Seven Hills Vineyard. A blend of Cabernet Sauvignon, Merlot and Cabernet Franc, it shows smooth, silky red cherry and blackberry fruit, with rich floral and spicy aromas of cinnamon and mocha on a vivid, earthy mineral finish. 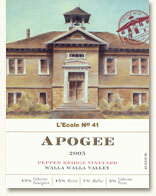 Given the distinctive differences between Pepper Bridge Vineyard and Seven Hills Vineyard, it only seemed appropriate to L'Ecole to name this wine Perigee. About L'Ecole Nº 41: A family-owned business, L'Ecole Nº 41 was founded by Jean and Baker Ferguson. Today, the winery is owned and operated by their daughter and son-in-law, Megan and Martin Clubb. Built in 1915, the schoolhouse is located in historic Frenchtown, just west of Walla Walla, Washington. Frenchtown derived its name from the many French-Canadians who settled the valley during the early 1800s. Legend has it, these men of French descent were raising grapes and producing wine. By the 1860s, nurseries, vineyards and winemaking had become a part of the regions' growing economy. The name - L'Ecole Nº 41 French for "the school" located in district number 41 - was chosen to salute these pioneer viticulture efforts. 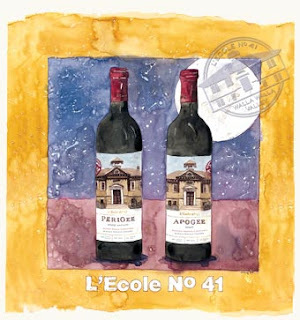 The colorful label features many of the personal elements that make L'Ecole Nº 41 unique. In 1984, an art contest was held among the elementary school children in the extended family. The hope was to receive a colorful image that could be used as a wine label. Many of the children drew pictures of the school building, others drew bottles of wine, and one drew the winery cat - Chat O. The $100 prize went to 8-year-old third grade cousin Ryan Campbell. 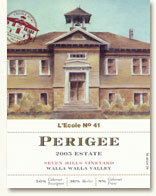 His watercolor rendition of the schoolhouse became the focus of the label.